As we are approaching the RTM (release to manufacturing) of the SQL Server 2017, I decided to focus on the implemented features in the upcoming release, thinking that if they are in the RC (release candidate) than most probably they will be here to stay and some of the next blog posts will be focusing on the features released in the CTP’s of the SQL Server 2017 that I have not mentioned before. The Release Candidate 1 of the SQL Server 2017 has brought one very significant and extremely long overdue feature support for the Columnstore Indexes. I am talking about the feature that was originally available in the SQL Server 2012 RTM and was taken away from the engine in the CU1 or CU2. Yes, that feature worked for the Nonclustered Columnstore Indexes that were read-only at the time of SQL Server 2012. The feature that in the Banking and Health industries are extremely widely used: Computed Columns. For the SQL Server 2017 RC1 Microsoft silently added the possibility of using computed columns for the Clustered Columnstore Indexes and this might make a huge difference for some companies when deciding wether migration to SQL Server 2017 is worth it. From my own experience there were some scenarios were clients would get upset by the idea of moving away from the computed columns just because Columnstore Indexes did not support them, so that after asking for a long time about the computed columns I even created Include support for Calculated Columns on Columnstore Indexes. So when I found out that it was implemented I confess that I jumped for a joy a couple of times, I was so excited about it. My huge thanks goes to Jovan Popovic (Microsoft PM) for pointing out at it, since without a major announcement I did not found out this news on my own. I decided to create a new table, that I will call FactOnlineSales_Computed, containing a new column [EarnedAmount] that will be automatically calculated from the following equation that involves 4 different columns of the very same table: ([SalesAmount] – [ReturnAmount] – [DiscountAmount] – [TotalCost]). Additionally I decided load the whole FactOnlineSales table into the new table – this means 12.6 million rows and run a couple of tests to see how the engine behaves. The statement failed because column 'EarnedAmount' on table 'FactOnlineSales_Computed' is a computed column. Columnstore index cannot include a computed column implicitly or explicitly. If you look carefully at the execution plan, you will notice that the Columnstore Index Scan, Compute Scalar and Filter are basically where the magic happens – we scan the original 4 columns, compute the desired value for the [EarnedAmount] and only then filter those values. 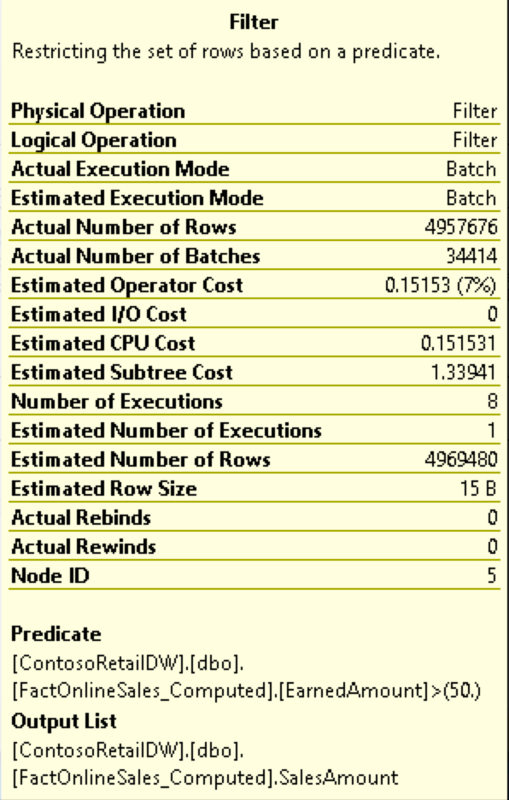 Look, this time we have a predicate pushdown to the storage engine with just 4.9 million rows out of the 12.6 million rows coming out of the Clustered Index Scan, plus there are no computer or filter operations. I definitely wish to see the same functionality on the Columnstore Indexes side, if not now – then fixed in the near future. Lets see now if we run the query getting the average EarnedAmount out of our table – will we get some surprises on the execution side for both types of the table (Rowstore & Columnstore). Will there be a Aggregate Predicate Pushdown for the Columnstore Indexes? This time the execution plans are essentially the same in the form with 2 Compute Scalar operations where the value for the EarnedAmount is calculated and then aggregated. The execution time is of course slower for the Rowstore, since all relevant operations for the Columnstore Indexes runs in the Batch Execution Mode and this is where we get the biggest speed advantage over the Rowstore Indexes. Let’s recreate our table, this time making our calculated column [EarnedAmount] as a persisted one. First of all this is a huge pity that the computed columns are not supported right now, but the irritating part here is the error message itself, delivering wrong message to the final user – the non-persisted computed columns are in fact supported. I understand that storing the data in the Columnstore Index is much more difficult than just calculating the values out of it, but this feature is very needed, especially if the calculations are extremely complex or if we want to use this computed value as a predicate. The statement failed because column 'EarnedAmount' on table 'FactOnlineSales_ComputedNCCI' is a computed column. Let’s see if the In-Memory Columnstore Index supports computed column and I do not hold my breath here, especially since the on-disk Nonclustered Columnstore Index does not support them. Clustered columnstore indexes are not supported on memory optimized tables with computed columns. First of all – I am HUGELY excited about computed columns getting their way into the disk-based Clustered Columnstore Indexes. HUGELY – I have been missing this feature for way too long! It is a huge pity that right now we do have support for the computed columns only in their persisted variant, and the only scenario that is supported is the one for the DWH (Data Warehousing) with disk-based Clustered Columnstore Indexes. I do admit thought that mostly the usage of the computed columns in my experience is related to the DWH, mostly because regular developers have no need for calculations with complex formulas to deliver to the final user, and if there are such computations – they do not change frequently. Still, I am hoping for a full implementation of the computed columns support for all Columnstore Indexes scenario, as I put in my original connect item: Include support for Calculated Columns on Columnstore Indexes, especially for the persisted computed columns. Amazing article and so helpful!!! Thank you for the kind words, Waheed!